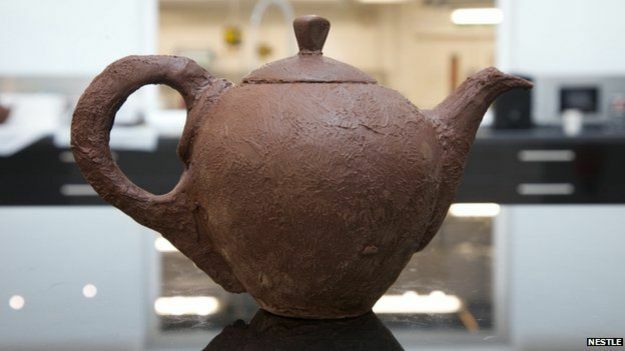 Could a chocolate teapot actually be useful? 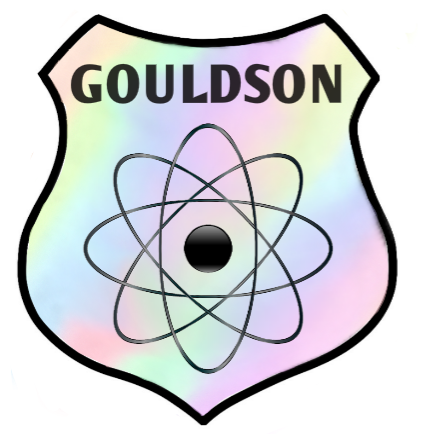 Can a chocolate teapot hold boiling water? This question was asked by Liz from St Albans, UK. Anyway, in 2014 a team of chocolatiers from the Nestlé Product Centre in York, UK decided to put this to the test. They experimented for 6 weeks before hitting on the ideal quality and thickness of chocolate. They did this using inflated balloons that were dipped in chocolate and allowed to set; they gradually increased the number of times a ballooon was dipped until they found the best thickness. 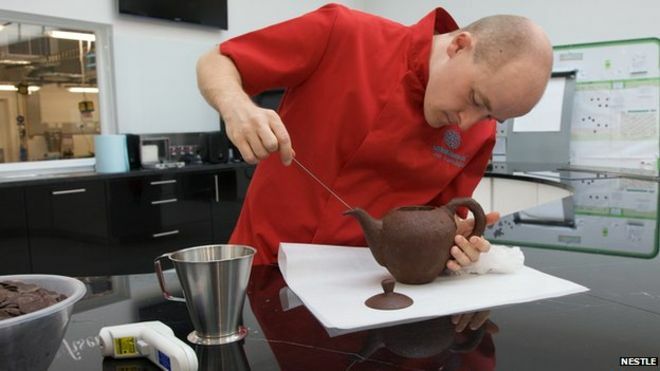 The resulting teapot was constructed from chocolate with 65% cocoa solids; master chocolatier John Costello chose this because the lower fat content meant the teapot held its shape better. The team then created a silicone mould, into which they poured molten chocolate in multiple thin layers. The mould was tapped and shaken to remove any air bubbles that might have formed, and once the teapot had set it was removed from its mould. A slender hole had to be bored through the solid chocolate spout so that the tea could be poured. The hole being bored into the teapot’s spout. When tested, the teapot held the boiling water well. As long as the water wasn’t stirred only a thin layer of chocolate, the layer in direct contact with the hot water, melted. This viscous layer helped insulate the solid chocolate while the tea steeped for a couple of minutes. This is because even though the chocolate used contained less fat than usual it still contained quite a bit; fat is a thermal inhibitor and stops heat being transferred as easily. When the tea was poured and drunk, it was drinkable and had only a slight chocolate flavour. You can see for yourself by watching this video about the chocolate teapot.